These are wheat-, gluten-free, and can be dairy- and soya-free, too, depending on which fat and milk you use. Do be sure to buy a really good-quality dark chocolate, such as Green & Black's or Lindt, as it makes such a difference to the flavour. As with all choux pastry, don't over-beat it at the first stage, or it may not rise properly and may crack during baking. Heat the oven to 200°C, gas mark 6. Line a baking tray with parchment. Put 300ml water in a pan with the butter or spread. Bring to the boil. Tip the flour into the boiling water. Beat until the mix comes away from the side of the pan, but no longer. Cool slightly then transfer to a mixer or bowl. Gradually add the eggs, with the mixer running, beating until smooth and shiny (or beat in the eggs with a wooden spoon). Put heaped teaspoonfuls of the pastry on the lined tray. Bake for 35-40 minutes or until well risen. Cut in half and remove any uncooked dough from inside each puff. Leave to cool. In a pan, mix the milk into the cornflour until smooth. Heat gradually, stirring, until thickened. Gradually add 70g of the chocolate and all the Cointreau. Stir until smooth. Set aside to cool. Fill the profiteroles with the mixture and arrange on a dish. Melt the remaining chocolate over a pan of simmering water. 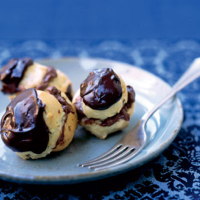 Stir in the brandy or water, spoon over the profiteroles and serve. This recipe was first published in Sun Jan 01 00:00:00 GMT 2006.